Quick note about my favorite time of the year and my favorite time of the day... 5:30 am, Pacific Northwest Time. I have lived for this for the past 16 years, waking up to soft cries of seagulls, low hum of the ferry, and of course barking sea lions. (I am not kidding about the barking!) Wish you were here to enjoy a cup of coffee on my deck this morning..
Made my way here via blogupp, and look forward to your visit. I've not traveled in your neck of the woods, so will be fun to see through your eyes. 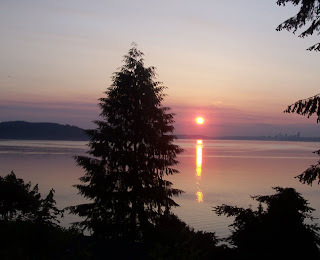 I used to live on Whidbey Isalnd in the Pugent Sound. Just breath taking.